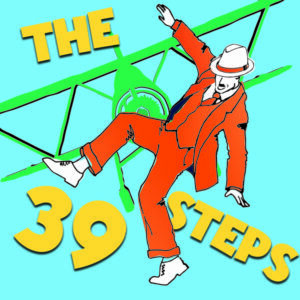 In 2005, Patrick Barlow wrote an adaptation for The 39 Steps as a stage play, based on both the film and book versions of The 39 Steps, but especially the film. He wrote the script to be played entirely by a cast of four; one person to play the protagonist Richard Hannay, one woman to play his romantic interests, and two others to play the other 150+ characters on their journey. Thus, the play is exceptionally comedic in comparison to the serious spy story played out in the film. The script is also full of allusions to other Hitchcock works such as Strangers on a Train, Rear Window, Psycho, Vertigo, and North by Northwest. The play premiered in 2005 at the West Yorkshire Playhouse, where it eventually transferred to the Criterion Theatre in London’s West-End in September of 2006. The 39 Steps continued to play on the West-End until 2015, making it the 9th longest running West-End show in London’s history. The 39 Steps runs Thursdays, Fridays and Saturdays at 8 p.m. and Sundays at 2 p.m., June 22 through July 8. Two preview performances take place on Wednesday, June 20 and Thursday, June 21, both at 8 p.m. All performances will take place in the Beverly O’Neill Theater at the Long Beach Performing Arts Center, 330 E Seaside Way. For tickets or more information, please call the box office at 562-436-4610 or visit ICT online at www.InternationalCityTheatre.org.